Nafion is a well-known polymeric material widely used in commercial applications, being the most common material for polymer exchange membranes (PEMs), which can be used in both proton-exchange fuel cells (PEMFCs) and direct methanol fuel cells (DMFCs) due to its high ionic conductivity as well as its good mechanical, chemical and thermal stability. 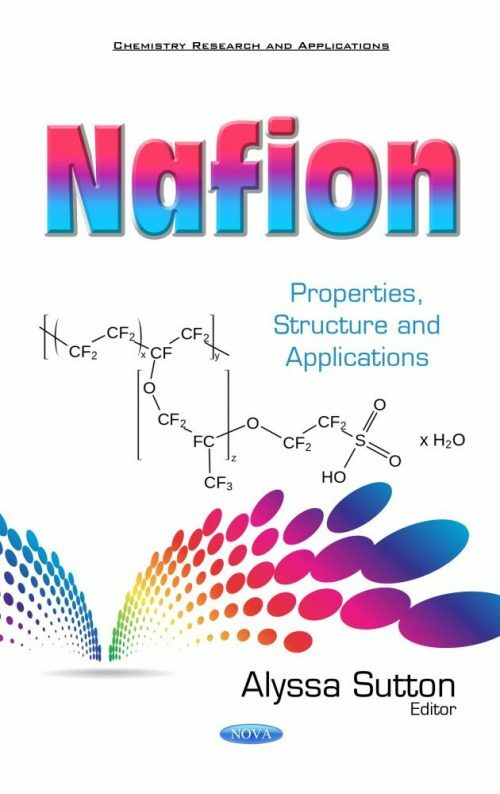 This book studies the properties, structure and applications of Nafion. Chapter one reviews the state-of-the-art of the several models describing Nafion’s morphology and provides a wide overview of their implication in the synthesis of NPs. Chapter two discusses separated electrode solutions as a tool to reach closer steady state in isoelectric focusing. Chapter three examines a study on the kinetics of neutralization and exchange reactions of Nafion. Chapter four discusses surface modification of a Nafion membrane due to phenyltrimethylammonium cation doping. Chapter five describes the positioning control method of Au-Nafion IPMC. The last chapter analyzes the progress of multifunctional spin crossover complex film based on Nafion. Nafion Nanocomposites: Does The Polymeric Structure Drive the Features of Nanoparticles or Vice Versa?